I created these pages to finally put online some of the Java hacks I had been developing over the time. 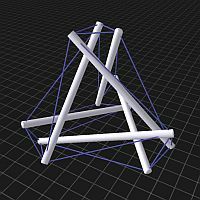 Currently online is my Tensegrity Applet and an implementation of some non-linear mappings. Information on what this actually is all about can be found in the respective pages. The motto of these pages is complexity which arises from very simple rules. 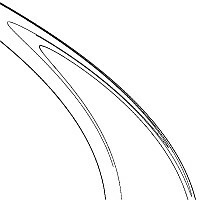 Complexity can unfold in the time domain as well as in space. An example for complexity in the time domain is the behaviour of physical systems governed by very simple, but non-linear, equations. These describe how the system develops over time. 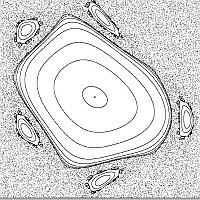 Typically, the "simple", regular solutions to these equations are outnumbered by very complicated solutions exhibiting quasi periodic and chaotic behaviour. 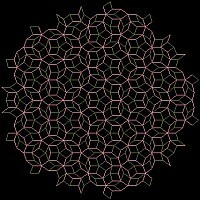 Go to the Nonlinear Mappings page to explore. 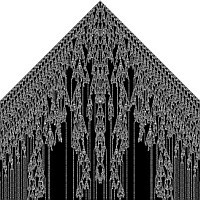 Cellular automata, thoroughly investigated by Stephen Wolfram in his "A new Kind of Science" are discrete variants of time dependent complex systems. 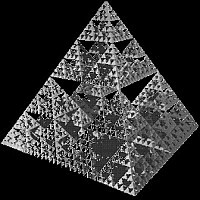 Complexity in the space domain is exhibited by fractal structures like the Sierpinski Gasket, Penrose tilings or also by tensegrity structures, in which simple sticks and strings combine to form quite intricate objects (here "complex" is used more in the sense of complicated and interesting, rather than in its technical meaning).